As Google and other tech giants gain weight in Washington, the gap between values and political value seems to be widening. A great howl of outrage emanated from the environmental community yesterday after it learned that Google Inc—of the well-known motto “don’t be evil”—hosted a fundraiser for James Inhofe, a far-right senator from Oklahoma notable for his vociferous denial of climate change and refusal to hire gay staffers. Google professes to be making “a better web. Better for the environment.” They have made big investments in renewable energy, and lobbied the government to do the same. 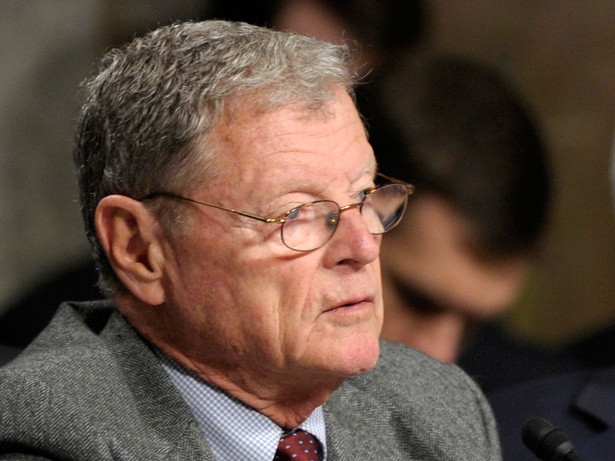 In 2011, they armed climate researchers with new media strategies in order to better take on the skeptics—people like Inhofe. What exactly does Google need Inhofe to do for its Oklahoma operation, which the company is expanding? Inhofe isn’t explicitly relevant to Google’s other interests. He doesn’t lead any pertinent committees, he opposed net-neutrality rules and he’s against comprehensive immigration reform, which Google is pressing for in order to get an expansion of visas for high-skilled employees. Perhaps a general interest in corporate welfare brings the two together, but Inhofe is pretty small fry in the pool of business-friendly Republicans. In Washington, Google leads the computer and Internet pack. The company was the biggest single donor at the annual fundraising dinner for the Competitive Enterprise Institute in June, kicking $50,000 to the libertarian group that shares privacy interests with Google, but also has invested massive resources to downplay the seriousness of climate change. “They’re a force to be reckoned with in terms of lobbying influence,” said Sheila Krumholz, executive director of the Center for Responsive Politics. In 2012, Google spent $18.2 million on lobbying to become the eighth-biggest spender, ahead of defense giant Lockheed Martin. Last year the company hired Susan Molinari, a Republican lobbyist, to head a Washington office that employs more than 100 people. What’s more, as Krumholz noted, “they are able, pretty handily, to match their lobbying influence with campaign contributions.” Google’s cash was nearly evenly split across the aisle last year, with much of the money for Republicans directed to people likely to carry weight in immigration reform. For Google and other tech giants, the gap between values and political value seems to be widening. While over 11,000 people organized by Forecast the Facts signed a petition against the Inhofe fundraiser, the luncheon went forward. That’s likely a sign of things to come. Big Coal and Republican lawmakers are pushing to expand mining operations—but why isn’t the Obama administration stopping them?